Because a lot of development of mineral resources, the amount of available resources have been reduced, resulting in ore mining taste dwindling, smelting and other subsequent processing of mineral product quality requirements are increasing. Meanwhile, the human consciousness of environmental protection increasingly strengthened. These realities made for quarry plant increasing demands, prompting processing equipment to keep the bigger, better and efficient energy-saving direction. 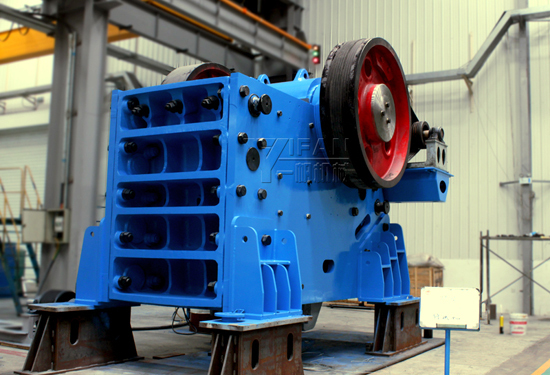 Zhengzhou Yifan Machinery crusher equipment, there are many, including jaw crusher, impact crusher, cone crusher and so on, our mineral quarry equipment in the production line demonstrations all over the country, you are welcome to buy. Jaw crusher is the crushing equipment appeared earlier, because of its simple structure, rugged, reliable, easy to maintain and repair as well as less production and construction costs, and therefore, until now still widely in metallurgy, chemical industry, building materials, electricity, transportation and other industrial sectors, for breaking strength at 147 ~ 245MPa of various ores and rocks of coarse, medium and fine crushing. In recent years, Yifan machinery to meet the metallurgical, mining, construction and other industrial sectors crushing high strength, high hardness needs, specially developed a new type of JC jaw crusher.